I finished the reindeer ornament I had been stitching and was so excited to get it to my local needlepoint store that I forgot to take a picture of it! ;) It has been sent off to the finisher and I will take a picture when it comes back. It was fun to pick out a fabric for the back and cording for around the edge, but man! It's going to be an $80 ornament by the time I get it back (I paid about $30 for the canvas and it's about $42 for the finishing). Yikes! I am toying with the idea of making an ornament for each of my boys every year but that's going to be a pricey tradition. I found it HERE. 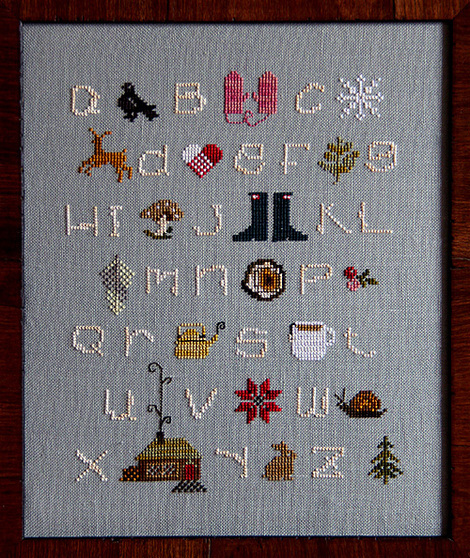 I love the linen background color, the cute little boots and mitten and the whimsical lettering! I can't wait to get it. It's a kit that Alicia Paulson put together and I figured for my first larger cross stitch piece and first try at linen, a kit was the way to go. Now I need a 4" hoop and some needles. Be careful with the hoops. Sometimes on linen it can leave a "fold" line that is almost impossible to get out. Do you have any quilting Q-Snaps? They work much better on linen. The kit is cute! Very whimsical. This page contains a single entry from the blog posted on August 5, 2012 4:54 PM. The previous post in this blog was Moxie Doxie and Small Blog Meet. The next post in this blog is Beginnings.